If you're comfortable using the basic features of Lightroom, but really want to push the envelope with this powerful software, Inside Lightroom by acclaimed photographer and Lightroom Beta-tester Richard Earney is a must-have. Bypassing the obvious features covered in a variety of existing Lightroom books, Richard focuses on customizing Lightroom to suit your workflow. For example, he covers using presets to automate the way Lightroom deals with photos, optimizing your Lightroom workflow for your own hardware and preferences. He covers sophisticated calibration techniques, helping you render your pictures accurately both onscreen and in print. Basically -- the hidden information for this powerful software. Unlike the other 'guides' on the market, this book doesn't tell you what you already know. Instead, it focuses on what you don't. 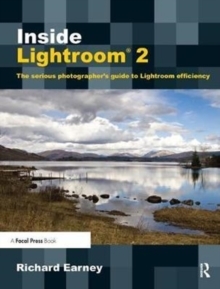 'Inside Lightroom' also showcases new features of the software, available only in Lightroom 2.0, so if you have recently upgraded from Lightroom 1, this book will help you reap the benefits of your investment. 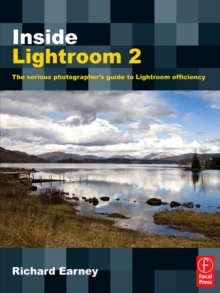 Practical, jargon-free and full of stunning images, Richard Earney's book should be on the shelf of every Lightroom user.